Do you know what the difference is between a dead man and the following story created by Joshua Williamson, Scott McDaniel, and Howard Porter? Well, one of them is dead, while the other was published by DC Comics in January, 2018. Case closed. TO QUOTE Beck: 'Two men look out the same prison bars; one sees mud and the other sees stars'. Why did he do it? Why did the Trickster confess to a crime he didn’t commit? 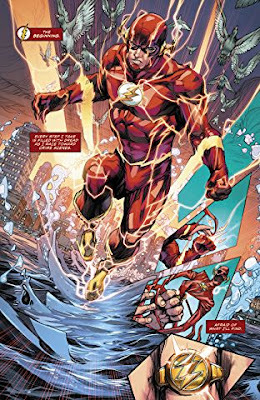 After all, he has no clear motive, he was nowhere near the scene when it happened, and most importantly of them all, Barry Allen suspects that there’s something else at play here, especially since the crime in question involves the murder of Roscoe Hynes, AKA Turbine, a fellow villainous inmate. So what does he do next? Barry I mean. Does he jump into action and try to figure out why the Trickster would lie like this? No, I’m afraid not, all because Warden Wolfe and Director Singh have given him strict instructions that prevent him from investigating this particular case. That said, however, nothing is stopping him from popping over to Central City and teaming-up with Kid Flash in order to prevent the Bug-Eyed Bandit and the Trigger Twins from robbing a bank! Although, to be fair, these three criminals mistakenly attempt to rob the same bank at exactly the same time, without really knowing that they’re both working on behalf of two warring crime lords. One of them being Copperhead, otherwise known as the snaked themed mob boss, whereas the other one is Captain Cold, or to be more specific about it, Captain Cold and the rest of the Rogues, who are currently in prison and glad that one of their own has confessed to a crime he may not have committed. Yes. You guest it. The Tricksters confession was nothing more than a ruse, a ruse which has confused Barry to such an extent that he doesn’t know which way to turn! I mean, he can’t question the Trickster because he's been beaten up by the prison guards. He can’t examine Turbine’s jail cell because he’s been ordered not to investigate his death. Plus, to make matters even more confusing, he can’t search, snoop, or quiz any other piece of evidence for exactly the same reason. Part One) A WONDERFUL MESS: First off, please allow me to say that I really enjoyed reading these two episodes of the Flash. Not only were they brilliantly illustrated and fun to follow, but in addition to this, they also managed to tell a story that was one part suspenseful, one part dynamic, and one part a wonderful mess. Yes. That’s correct. I did say that these two episodes were a mess. Not literally, mind you, or thematically either, but structurally each issue did seem slightly topsy-turvy when it came down to its overall composition. Take issue 36 for instance, the issue that sets up the basic narrative. The first section unveiled the crime in question. The second section placed a number of barriers in our hero’s path. The third section segued into a scene which initially appeared unrelated. And finally, the fourth section brought the plot right back round to where the first section began — murder mystery style. Now by describing the story in those terms you can clearly see the cylindrical nature of how this episode flowed from start to finish. But where the details are concerned, well, sometimes there were these mini-scenes placed in-between more major ones, which occasionally plugged up the narrative, tonally, if not structurally. This made the plot messy, slightly convoluted, and mildly distracting, up to a point, plus it wasn’t quite clear what was and what wasn’t important to the general narrative. In a good way of course! After all, this story can easily be defined as a murder mystery, and as such, it has to keep us on our toes with little distractions here and there. Part Two) MORE-MORE-MORE: The one thing these two episodes don’t have in common is the fact that issue 37 divulges a lot more information than issue 36. From my point of view this makes the second of these two issues a much more satisfying read, saying so because it allows us to understand what is going on with the overall plot. Through this, it also makes us ask a number of very poignant questions. 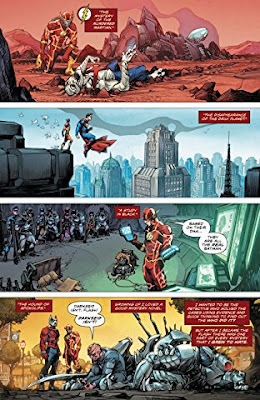 Such as: How will Barry be able to take on the Rogues all by himself? Will he join forces with Copperhead or decide to take her down next? Plus what about his current job at Iron Heights Penitentiary? He can’t stay there, not now, not now he and Kristen have discovered how shabbily Warden Wolfe treats his inmates. But wait, before I get on to that particular point, I would just like to mention Joshua Williamson and the marvelous way he’s depicting most of the characters featured in these two issues. 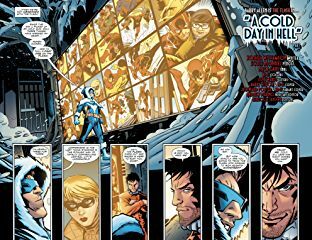 Ranging from Barry's partnership with Kristen and Wally, how each member of the Rogues gallery interact with one another, as well as the slippery way August seems to be maneuvering himself through the story-line, all in all I'm just loving these more personal touches and the manner in which they’re being conveyed on the page. 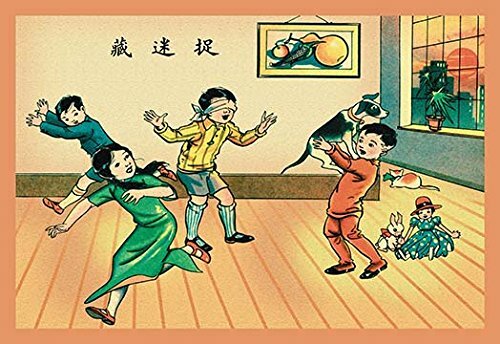 Part Three) KICK THE TRICK: That said, however, the one thing I wasn’t too keen on was how the police easily accepted the Tricksters so-called confession! Come to think of it, that whole sequence where he attempted to make his escape was downright silly, too silly for me, plus his mistreatment by the prison guards does throw out a lot of mixed signals. I mean, are we seriously supposed to believe that the authorities would rather take the word of a known criminal over procedural evidence? Or for that matter, that he actually had the audacity to try to break free in the middle of a police investigation? Also, where his mistreatment is concerned, will this plot point be expanded upon further down the line, or alternatively will it be discarded and thrown away? If it does get dropped, what does that say about the Flash, this book, as well as the whole notion behind prisoner mistreatment? For us to really care about these prisoners we have to understand what makes them tick and turn to a life of crime! If the story doesn’t address this, why should we care and what was the point behind it? Was this beating put in place just to show us how cruel Warden Wolfe truly is? Or was this just a crafty way of making us sympathize with a character who is usually very nasty? Please let me know what you think in the comment section below. Part Four) ART IS LIFE: I’ve loved Howard Porter’s artwork ever since I first saw his efforts on the Grant Morrison version of the Justice League. Heck, even back then I knew he was a really good artist, really-really good, saying so because he made his heroes look truly heroic by giving them a realistic yet polished edge. I mean, just take a look at some of the illustrations I’ve placed around this article, and you can see for yourself how good he really is. He’s so good in fact, that he can even make the Flash’s new costume look a lot better than it actually is. Well, to be honest, I’m not a big fan of those silly lines that pollute his uniform. I just don’t see the point to them myself, and yes, they do distract the eye when something important is going on. But not when Howard is on the case. No. Thankfully not. Somehow he manages to subdue these lines by concentrating his efforts towards Barry’s facial expressions and body posture, with a good example of this being seen during the bank robbery sequence featured in issue 36. Even though it may seem like a fairly silly scene, what with it showcasing five characters -- three bad, two good -- all wearing brightly colored costumes and behaving in a brightly colored fashion, that’s not to say that Howard can’t tonally transform it into a serious scene, simply by making each person seem more real, more expressive, and more nuanced in style. Go on, have a look at this section as I’m sure you will be able to see what I’m talking about. Funnily enough, I can say exactly the same thing about Scott McDaniel’s artwork featured in issue 37. Although, in his case, Scott’s style of art is much more cartoonish by design, bordering on the conceptual, plus I do like the way he conveys emotion, action, and pathos within a scene, a sequence, or a facial expression, without them seeming overly contrived or forced on the page. Like Howard, I first became aware of Scott’s artwork when he was drawing other titles published by DC, such as Nightwing, Batman, etc, and after seeing those books I do feel that his bold and kinetic style does suit a free flowing series like this one. Again, look at the image provided and you can see how his brisk illustrations seem far more compatible with a fast paced adventure than a slow and moody detective story. Don’t you agree? I would like to musically match up these two issues with the Snoop Dog song, ‘Murder Was the Case’, simply because they both share two specific themes: Murder and Prison. Have you ever played a game of hide and seek? Yeah, sure you have, especially as a kid. It’s a game where a person has to find a collection of people, preferably one or more, who are each hiding within a space or area that’s not too big, not too far, and not too difficult to venture through. Like a prison perhaps, but only a lot more cleaner, ha! A face to face rap off.